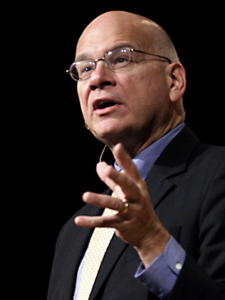 Tim Keller showed me how easy it is to make connections between Old Testament passages and the gospel of Jesus Christ. As I said in the previous post, theologian Phillip Cary was the first Christian thinker to show me this truth, but Tim Keller, my favorite contemporary preacher, taught me how to put it into practice. Those who promote the Christo-centric approach generally defend their view by quoting Luke 24:27. Take a close look at the two statements below. The first is the actual text of Luke 24:27, the second is how most Christo-centric proponents explain the verse. 2) And beginning at Moses and all the Prophets, He expounded to them that all of the Scriptures were things concerning Himself. Even in last week’s scripture about David and Goliath, for instance, it was easy to see how this story points to Jesus. The people of Israel were facing a fearsome enemy that they were too weak, too afraid, and too powerless to defeat on their own. Just as Goliath was a “champion” for the Philistines (1 Samuel 17:4), Israel needed their own champion to fight and win the battle for them—a representative or substitute who could do for them what they were unable do for themselves. Their champion, David, had the kind of faith in God that they couldn’t muster on their own. And in rejecting Saul’s armor and weaponry, David confronted his enemy not in strength but in apparent weakness and vulnerability. Yet he defeated the enemy and saved his people in the most surprising way imaginable. Do you see how this reminds us of Jesus? Our Lord became humanity’s representative or substitute. He lived a life of perfect faithfulness to his Father that we were unable to live for ourselves. On the cross, he defeated the fearsome giants who threatened to destroy us—sin, Satan, and death. And he did so in the most surprising way possible—through the cross, a symbol of weakness and shame. Is this unwarranted eisegesis, or do you believe that the Lord intends for us to make these kinds of connections? In my next post on this subject, I’ll talk about how the early Church read and interpreted the Old Testament. This entry was posted on	October 5, 2014 at 11:05 pm	and is filed under Uncategorized. Brent, I do think there is a lot in the Old Testament which is “symbolic” of Christ. However, I think it may be going overboard to try to read it all that way (even with the caveat you mention). I think a lot of the Old Testament is history which “leads up to” Christ, but isn’t itself necessarily “pointing to” him. For example, most of the history of the kings in Samuel, Kings, and Chronicles in large measure isn’t necessarily trying to point us to anything, other than perhaps the general point of consequences of following God or not (which a whole lot of the Old Testament is intent on doing, in my view). I guess you could argue that this “points to” Jesus as being the only one who could “fully obey,” but I think that is a stretch as being what it is trying to “show.” And what about the “high priestly garments”? What are they trying to tell us about Jesus? Or the various stories in Judges? In short, I think there is a fair chunk of the OT which is making points about our relationship to God other than specifically “Jesus” points (and sometimes just history).